When it comes to setting up UCITS compliant hedge funds in Ireland one legal firm is requested more than any other: Dublin-headquartered Dillon Eustace. Not a small achievement for a firm that was created as recently as 1992, only a few years after Dublin set itself up as a low-tax jurisdiction for international financial services companies. At the time, the first UCITS directive had just been implemented in Ireland and there was an influx of international banks and asset servicing companies, all needing legal advice to help them navigate the maze of Irish and EU law. The firm set up a large, specialised unit to service this industry from the outset and it soon established a reputation as one of the leading firms in the area. It now advises more Irish domiciled investment funds than any other Irish firm. Although the firm started with a separate and distinct alternative investment fund practice, over time, as the distinction between alternative and traditional funds became less relevant, the firm’s various specialists were all subsumed into one asset management and investment funds department. Now a core group of 15 partners work directly in the funds area, covering the full range of fund types, and further partners support the funds practice in areas such as tax, corporate, regulatory compliance, litigation, stock exchange listings and company secretarial. They cater to clients who manage traditional funds and alternative funds, be it Irish or Cayman. Dillon Eustace’s strategy has, up until last year, been to focus on its home jurisdiction of Ireland and to operate representative offices outside of Ireland to market the Irish firm, however, last year, the firm established a law firm in the Cayman Islands. The change of approach reflects the changing nature of law firms. “We took the view that we should expand our offering to better service our clients.” Dillon Eustace were impressed with the resilience of the Cayman Islands funds industry. “We believed that the case for Cayman Islands structures would not go away,” O’Connor says. When Dillon Eustace was first established, Ireland was going through a recession. The last couple of decades have seen Irish financial institutions facing more than their fair share of travails, but the local fund services sector emerged unscathed. Ironically, while the latest recession left Ireland’s economy battered and bruised, in many respects it has helped the fund services sector improve its competitiveness, as the price of services, rent and labour has gone down, making Dublin a more affordable place to do funds business. In the last twelve months this has translated into renewed activity, with new launches from fund managers around the world and the rate of growth in Irish funds out-stripping its European competitors. The case for launching both UCITS and Qualified Investor Funds (QIFs) out of Dublin appears stronger than ever. “There has been a significant increase in new fund launches since the middle of 2012 and a lot of it has been driven by new sponsors establishing European domiciled funds for the first time,” says O’Connor. With the imminent changes to the European non-UCITS regulatory environment, O’Connor believes that the case for establishing Irish regulated non-UCITS funds may be greater than ever before. O’Connor notes that, broadly speaking, about 80% ofthe funds that are set up in Ireland are UCITS funds, with a significant majority of the remainder being “Qualifying Investor Funds” for the sophisticated investor marketplace. When it comes to alternative UCITS funds, investment managers typically approach Dillon Eustace with a very clear idea about what they want to do, but because of the portfolio regulation on UCITS funds such as a ban on physical short selling and restrictions on the use of prime brokers, managers often have to adjust the manner in which they implement their strategies to be UCITS compliant. Qualifying Investor Funds, on the other hand, have very few portfolio level restrictions and, O’Connor remarks, there are very few constraints placed on the manager’s strategy and as a general rule, these funds are not as compliance heavy as UCITS. 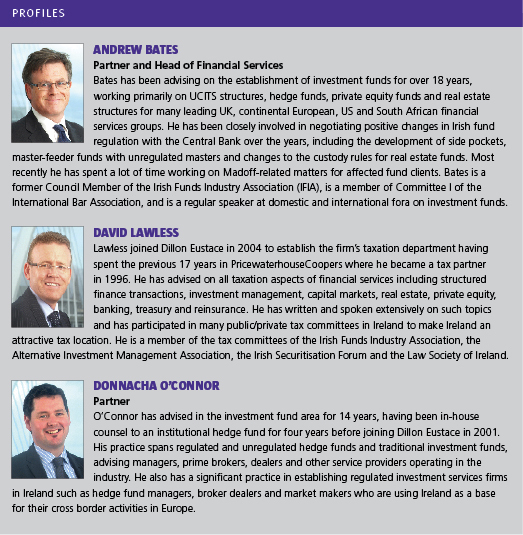 “Many alternative strategies that are sold to EU institutional investors are packaged as UCITS and that is often because these investors like the mandatory fortnightly liquidity, the fact that the assets a UCITS can hold are constrained, and that there are diversification and concentration rules,” says O’Connor. As a result a lot of those funds were “square pegs in round holes,” he adds. The AIFMD imposes very few portfolio level restrictions on non-UCITS funds compared with UCITS funds, however, there is a substantial amount of regulatory oversight and mandatory transparency to investors and regulators alike. “If managers who used to launch UCITS hedge funds can set up an Alternative Investment Fund in a European fund domicile that will be acceptable to institutional investors, a lot of managers may switch because their strategies should fit more neatly within that framework than UCITS and might be run more cost effectively,” says O’Connor. Even with all the head winds from new regulation in Europe and the next debt crisis around the corner, as in the recent case of Cyprus, Ireland remains one of Europe’s preferred locations for setting up hedge funds and within that space Dillon Eustace is well positioned to cater to the industry as it evolves and adapts to new regulatory and market realities.